One of the North's first acts at the outset of the Civil War was the attempt to force the Confederacy into submission by blockading its ports. The objective was to deny the South access to supplies and to shut down its export of cotton to England - its major source of revenue. To counter this threat, the Confederacy began to build a fleet of ships clothed in iron panels that made them impervious to enemy cannon fire. Armed with an underwater ram, these ships were designed to slam into and sink the enemy's wooden vessels. The first of these Confederate "Ironclads" was constructed upon the burned-out hull of the USS Merrimac left behind by Union forces when they abandoned the Newport, Virginia shipyards early in the war. Although christened the CSS Virginia by the Confederates, the new ship has retained its original name following the tradition of naming a ship after the name of its hull. At noon March 8, 1862, workmen completed the final touches of the Merrimac's construction and the cumbersome warship steamed from her mooring into the James River and history. Waiting for her only a few miles away was a bevy of Union blockaders ready to do battle. It was no contest. The Merrimac rams the Cumberland. It was a warm, windless day. Recently washed clothes hung lazily from the rigging of the Yankee ships as the Merrimack slowly lumbered into firing range of the USS Cumberland, a thirty-gun frigate. The Yankee ships and surrounding shore batteries opened fire only to watch in amazement as their cannon balls bounced off the sloped sides of the Merrimack with no effect. 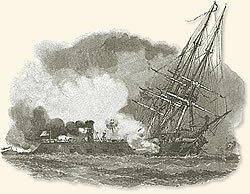 The Confederate ironclad rammed the Cumberland, striking a death blow that sent her to the bottom. She then turned on the fifty-gun Congress, which after a fierce hour-long battle raised a white flag in defeat. A third Yankee ship, the Minnesota, had run aground making itself an easy target. But dark was descending and the Confederates decided to seek a safe harbor, confident they could return the following morning to finish off the Minnesota. They were in for a surprise. During the night the North's answer to the Southern ironclad arrived on the scene. Described as a "cheese box on a raft" the USS Monitor also sported an iron exterior that repelled enemy fire. However, the strange looking craft's distinguishing feature was a revolving turret enclosing two cannon. This innovation allowed the Monitor to hold a steady course and aim its guns in various directions rather than maneuver the ship in order to fire upon the enemy. The stage was set for one of history's most famous naval battles. The barely sea-worthy Monitor left its shipyard in New York City on March 6 and nearly sank on its two-day voyage to the battle scene. It arrived on the afternoon of March 8 in time to hear the sounds of the battle but too late to engage the retreating Merrimac. The Monitor's diminutive size inspired little confidence among the Yankee sailors aboard the ships recently attacked and devastated by the Merrimac. "Worden lost no time in bringing it to test. Getting his ship under way, he steered direct for the enemy's vessels, in order to meet and engage them as far as possible from the Minnesota. As he approached, the wooden vessels quickly turned and left: Our captain...made straight for the Merrimac, which had already commenced firing; and when he came within short range, he changed his course so as to come alongside of her, stopped the engine, and gave the order, 'Commence firing!' I triced (raised) up the port, ran out the gun, and, taking deliberate aim, pulled the lockstring. The Merrimac was quick to reply, returning a rattling broadside (for she had ten guns to our two), and the battle fairly began. The turrets and other parts of the ship were heavily struck, but the shots did not penetrate; the tower was intact, and it continued to revolve. A look of confidence passed over the men's faces, and we believed the Merrimac would not repeat the work she had accomplished the day before. The fight continued with the exchange of broadsides as fast as the guns could be served and at very short range, the distance between the vessels frequently being not more than a few yards. Worden skillfully maneuvered his quick-turning vessel, trying to find some vulnerable point in his adversary. Once he made a dash at her stern, hoping to disable her screw, which he thinks he missed by not more than two feet. Our shots ripped the iron of the Merrimac, while the reverberation of her shots against the tower caused anything but a pleasant sensation. While Stodder, who was stationed at the machine which controlled the revolving motion of the turret, was incautiously leaning against the side of the tower, a large shot struck in the vicinity and disabled him. He left the turret and went below, and Stimers, who had assisted him, continued to do the work." sides, and the bow and stern; but these marks were obliterated early in the action. I would continually ask the captain, 'How does the Merrimac bear?' He replied, 'On the starboard-beam,' or 'On the port-quarter,' as the case might be. Then the difficulty was to determine the direction of the starboard-beam, or port-quarter, or any other bearing. It finally resulted, that when a gun was ready for firing, the turret would be started on its revolving journey in search of the target, and when found it was taken 'on the fly,' because the turret could not be accurately controlled. Once the Merrimac tried to ram us; but Worden avoided the direct impact by the skillful use of the helm, and she struck a glancing blow, which did no damage. At the instant of collision I planted a solid 180-pound shot fair and square upon the forward part of her casemate ... but the charge, being limited to fifteen pounds, in accordance with peremptory orders to that effect from the Navy Department, the shot rebounded without doing any more damage than possibly to start some of the beams of her armor-backing." "The battle continued at close quarters without apparent damage to either side...Two important points were constantly kept in mind: first, to prevent the enemy's projectiles from entering the turret through the port-holes, - for the explosion of a shell inside, by disabling the men at the guns, would have ended the fight, as there was no relief gun's crew on board; second, not to fire into our own pilot-house. A careless or impatient hand, during the confusion arising from the whirligig motion of the tower, might let slip one of our big shot against the pilot-house. For this and other reasons I fired every gun while I remained in the turret. Soon after noon a shell from the enemy's gun, the muzzle not ten yards distant, struck the forward side of the pilot-house directly in the sight-hole, or slit, and exploded, cracking the second iron log and partly lifting the top, leaving an opening. Worden was standing immediately behind this spot, and received in his face the force of the blow, which partly stunned him, and, filling his eyes with powder, utterly blinded him.... The flood of light rushing through the top of the pilot-house, now partly open, caused Worden, blind as he was, to believe that the pilot-house was seriously injured, if not destroyed; he therefore gave orders to put the helm to starboard and 'sheer off.' Thus the Monitor retired temporarily from the action, in order to ascertain the extent of the injuries she had received. At the same time Worden sent for me...I went forward at once, and found him standing at the foot of the ladder leading to the pilothouse. He was a ghastly sight, with his eyes closed and the blood apparently rushing from every pore in the upper part of his face. He told me that he was seriously wounded, and directed me to take command... I found that the iron log was fractured and the top partly open; but the steering gear was still intact, and the pilot-house was not totally destroyed, as had been feared. In the confusion of the moment resulting from so serious an injury to the commanding officer, the Monitor had been moving without direction. During this time the Merrimac, which was leaking badly, had started in the direction of the Elizabeth River; and, on taking my station in the pilot-house and turning the vessel's head in the direction of the Merrimac, I saw that she was already in retreat. A few shots were fired at the retiring vessel, and she continued on to Norfolk...The fight was over." Although the two ironclads had fought to a draw, the encounter rang the death-knell of wooden ships as fighting vessels. S. Dana Greene's account appears in Buel, Clarence, and Robert U. Johnson (eds. ), Battles and Leaders of the Civil War, Vol.I (originally published in Century Magazine, 1888; reprint ed., 1982). "The Battle of the Ironclads, 1862" EyeWitness to History, www.eyewitnesstohistory.com (2005). 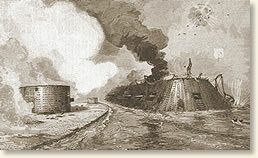 The Merrimac was set afire and destroyed by its crew in May 1862 just before Union forces overran the Confederate-held shipyards around Norfolk. The Monitor sank off Cape Hatteras, North Carolina during a gale on December 29, 1862.